Thank you for joining me for 31 Days of Joy! I have been grateful for the opportunity to think and write about joy for a month straight. It has been encouraging for me, and I hope that it has been for you as well. It is good to take the time to consider joy and how to live joyfully. In 1 Thessalonians we are actually commanded to be joyful! “Be joyful always; pray continually; give thanks in all circumstances, for this is God’s will for you in Christ Jesus” (5:16-18, NIV). It isn’t always easy, but because of what God has done for us it is possible to be joyful. I pray that you will seek the Lord and seek His joy no matter what challenges come your way. I pray that you will be “joyful in hope, patient in affliction, and faithful in prayer” (Romans 12:12, NIV). We have so much to be thankful for, so much to be joyful about. And if you know Jesus, the best is yet to come! 2. Shout for Joy to the Lord! 4. Why Do I Have Joy? 17. How Can You Have Joy? You can find other 31 Days bloggers at the Nesting Place: 31 Dayers. I wish I had found out about 31 days sooner. Found you through the just because party. New follower of your blog. Hi! I love your header! 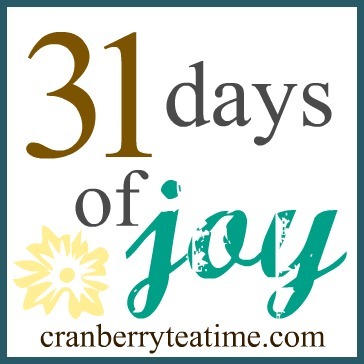 that cup of tea looks so inviting :) enjoying looking around your blog and reading some of your 31 days of joy posts. thanks for linking up! You did a most excellent job with this series...great job, Rachel! Joy is in the choosing...you do it well. Thank you, Shannon. That means a lot coming from you. Thanks so much for hosting that Just Because blog party. That was such a great idea! I was sick last week, so I wasn't able to visit many blogs during the actual party. I'm getting caught up now! Thanks so much for stopping by and for following my blog. I wasn't feeling well last week and couldn't join in for much of the blog party, so I'm getting caught up now. I'm off to check out your blog!